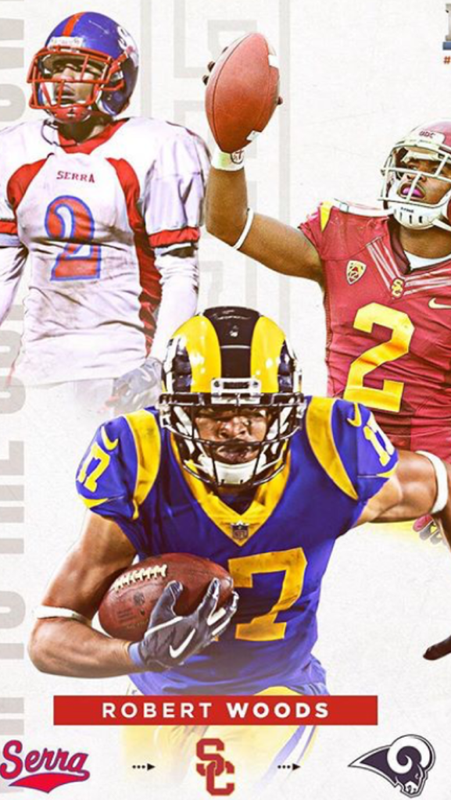 Super Bowl Sunday is February 3, and no one will be rooting for the Los Angeles Rams harder than the Serra High School community, not just because the Rams are the hometown team, but also because one of our own, Robert Woods '10, has been an integral component of this winning, hometown team. Over the years, over 20 student/athletes from Serra High School have moved on to the National Football League (NFL). The one getting the most attention right now is Robert Woods. Woods, while at Serra, contributed to the school community across the board. In 2009, Woods led the Serra Cavalier football squad to the State Championship, and now he has helped place the Rams on the brink of an NFL Championship, which would be the first for the Rams in Los Angeles. "The night after the game (NFC Championship Game), he texted me and said, 'Hey, Coach, I am going to the Super Bowl! I'm so fired up! '", said Head Football Coach Scott Altenberg, who coached Woods during Woods' four years at Serra. Reflecting on the '09 State Championship season and on Woods, Altenberg quipped, "Yeah, I'm a pretty good coach with Robert Woods on the team." Additionally, Woods was an All-American track star at Serra, winning championships in sprint events while at Serra. "He was a great leader. The kids loved him," said Altenberg. Finally, Woods was an outstanding student. "Robert Woods was self-disciplined. He took Honors classes with me. He took AP Physics with me. He took Economics and college courses," said Serra Vice-Principal Nadi Wissa. Woods, it turns out, spent as many semesters on the Honor Roll as he did being an athletic superstar at Serra. Woods has not forgotten his alma mater either, as he comes back every year to talk to the very football program that catapulted him into the national spotlight. We have not forgotten about you either, Robert. We hope that you and our hometown Rams capture the Lombardi Trophy, and, who knows, maybe you will be the Super Bowl MVP! We are Cavaliers. All hail!